Bacteria & Viruses - Welcome to The Frog Pad! Bacteria are the simplest of creatures that are considered alive. Bacteria are everywhere. They are in the food you eat, the soil that plants grow in, and even inside of you. They are very simple cells that fall under the heading prokaryotic. That word means they do not have an organized nucleus. They also lack organelles and are much smaller compared to eukaryotic cells. They do have ribosomes for protein synthesis. Even though they do not have nuclei, they do have DNA. It is grouped in an area called the nucleoid. They have cell membranes like other cells and a protective cell wall. Their cell wall is not like the one around a plant cell. It's a special kind that bacteria have for protection. In most bacteria, the cell wall is composed of a carbohydrate/protein molecule called peptidoglycan. All bacteria belong to Domain Prokarya, but there are two kingdoms: Eubacteria and Archaebacteria. Archaebacteria are bacteria that can survive in places no other organism could live. Thermophiles are bacteria that can survive in extremely hot places like the geysers in Yellowstone National Park. Methanogens are bacteria that produce a gas called methane. They can live in areas that don't have any oxygen. Halophiles can live in very salty places like the Dead Sea. They would die in fresh water. 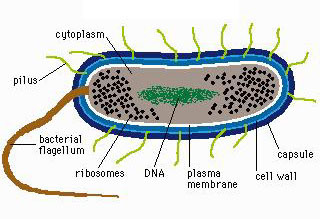 The Kingdom Eubacteria consists of mostly heterotrophic bacteria that come in three main shapes. They are cocci (spherical), bacilli (rod shaped-as shown above), and spirilla (corkscrew shape). Eubacteria can be found most anywhere including in the digestive system of animals. 1) ﻿Photoautotrophs﻿ - Energy and carbon are both obtained from photosynthesis. 2) Photoheterotophs - Energy is obtained from photosynthesis, but carbon must be obtained from food. Unlike eukaryotic cells, which divide by mitosis or meiosis, bacteria reproduce by binary fission. In this process, the genetic material is replicated, and the two copies move to separate nucleoid regions. Next, the plasma membrane pinches inward, producing two equal daughter cells. While these daughter cells are completely independent of each other, in some species they remain together, forming colonies and filaments. Binary fission can take place very rapidly, on the order of about one split every 20 minutes, accounting for the amazing replicative ability of bacteria. A virus (from the Latin virus meaning toxin or poison) is a microscopic, non-cellular infectious agent consisting of genetic material (RNA or DNA) surrounded by a protein (called a capsid), lipid (fat), or glycoprotein coat. Scientists differ on whether viruses are actually alive or not. Many people say they are non-living because they cannot reproduce without the aid of a host. Viruses also do not metabolize food into energy or have organized cells, which are usually characteristics of living things. Viruses are not simply taken into cells. They must ﬁrst attach to a receptor on the cell surface. Each virus has its speciﬁc receptor, usually a vital component of the cell surface. It is the distribution of these receptor molecules on host cells that determines the cell-preference of viruses. For example, the cold and flu virus prefers the mucus lining cells of the lungs and the airways. 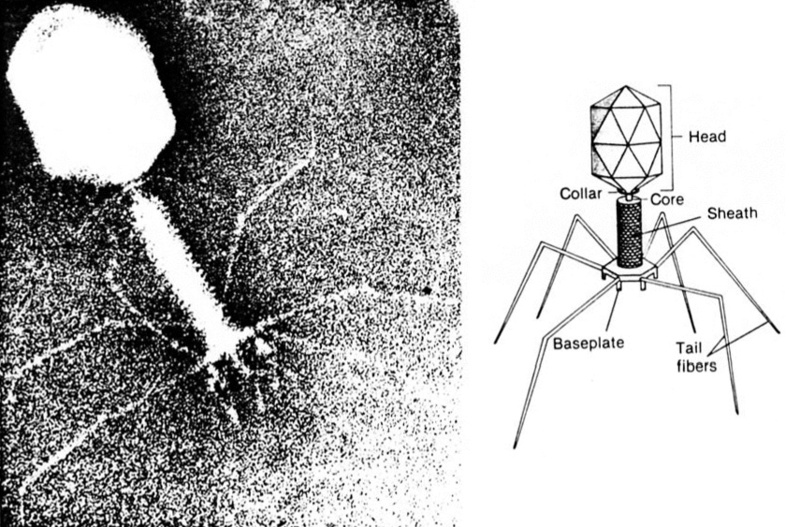 Viruses do not have the chemical machinery needed to survive on their own. They, thus seek out host cells in which they can multiply. These viruses enter the body from the environment or other individuals from soil to water to air via nose, mouth, or any breaks in the skin and seek a cell to infect. After contacting a host cell, a virus will insert genetic material into the host and take over that host's functions. The cell, now infected, continues to reproduce, but it reproduces more viral protein and genetic material instead of its usual products. It is this process that earns viruses the classification of "parasite". A cold or flu virus for example will target cells that line the respiratory (i.e. the lungs) or digestive (i.e. the stomach) tracts. 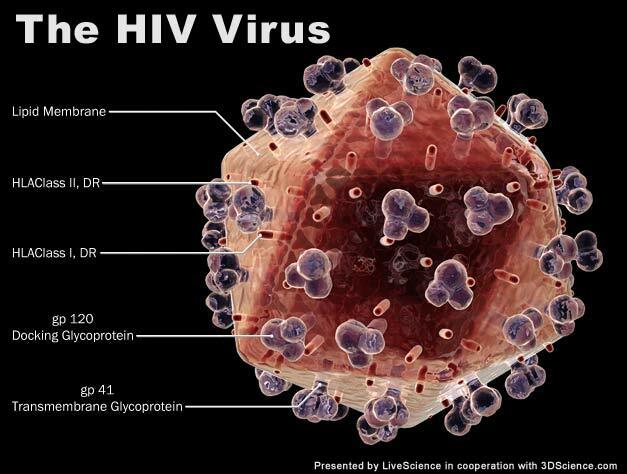 The HIV (human immunodeficiency virus) that causes AIDS attacks the T-cells (a type of white blood cell that fights infection and disease) of the immune system.